this week in math 10 we worked on systems. there arre 3 ways to find the answer. 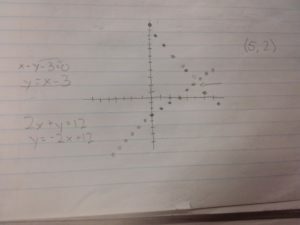 the first way is graphically solving the equation, this requires a graph, the first thing you do is change the form to y intercept then you graph the points using the slope and the starting point. 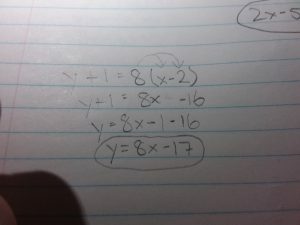 the next way is substitution, to do this one you isolate the variable (x or y) then so you end up with x or y = then you substitute the x or y for the equation that comes after the x or y= then simplify for 0 pairs. 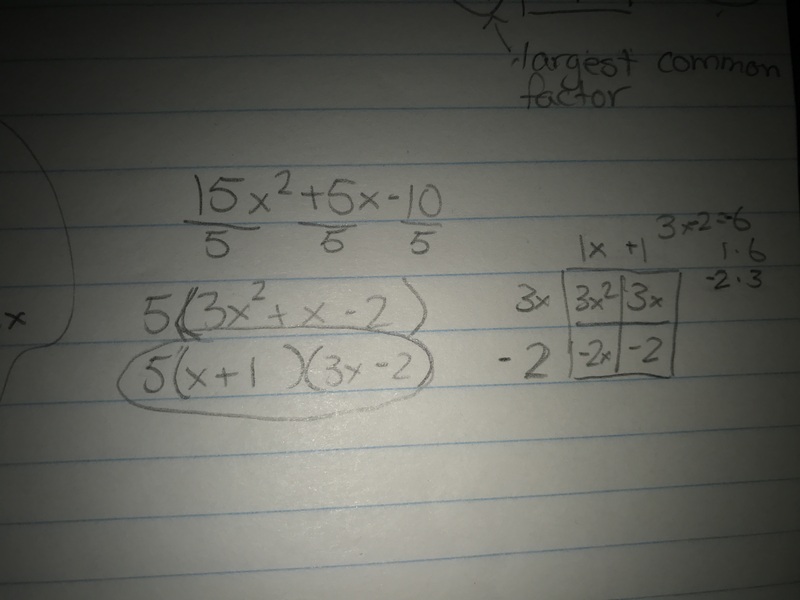 the last way is elimination for elimination the first thing you do is you find the common factor then you add or subtract the equations then you simplify for 0 pairs. 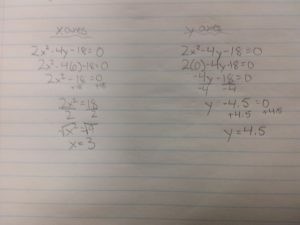 this week in math 10 we learned equations of lines. 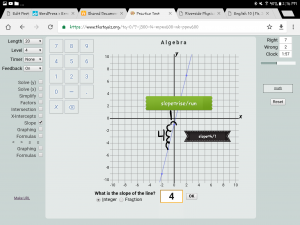 I am going to show you how to change point slope form into slope y intercept form. the first step is to distribute the number from infront of the bracket into the numbers inside. then you want to flip the number beside the y to the other side (when you do this you must change the sign) then if possible add the two constants and then you are done. 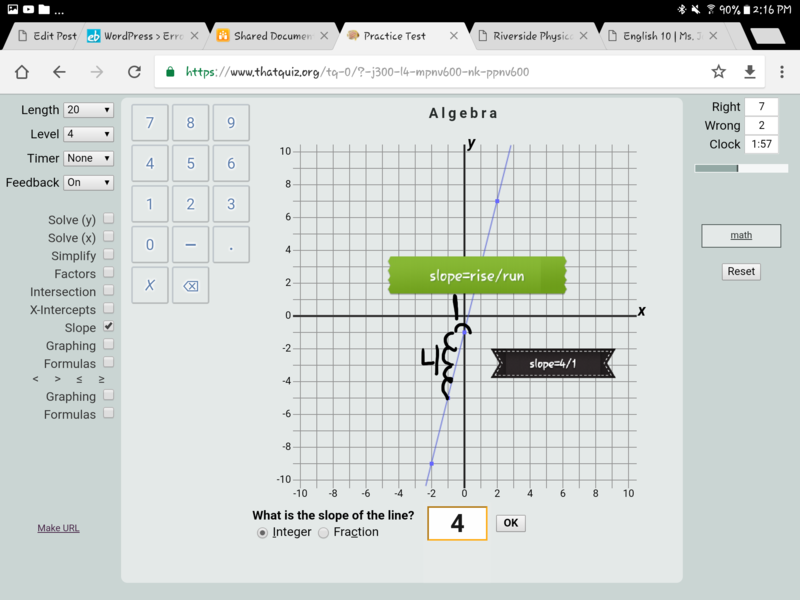 this week in math 10 we learned how to find the slope using a graph or cooridates. there are four types of slopes there is a posative slope, negative slope, zero slope and an undefined slope. a posative slope starts on thebottom on the left and goes up with a slpoe right, a negative slope is the opposite it starts on the bottom right and goes up left, a zero slope is a straight horizontal line, and the undefined slope is a straight verticle line. 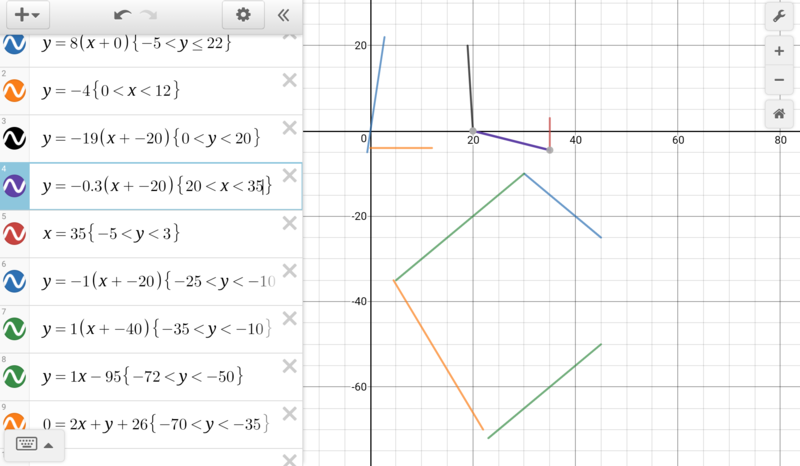 to find the slope you use the formula slope=rise/run, the rise is the y axes and run is the x axes. you then need to find two perfect points, this is a point on a grid line. 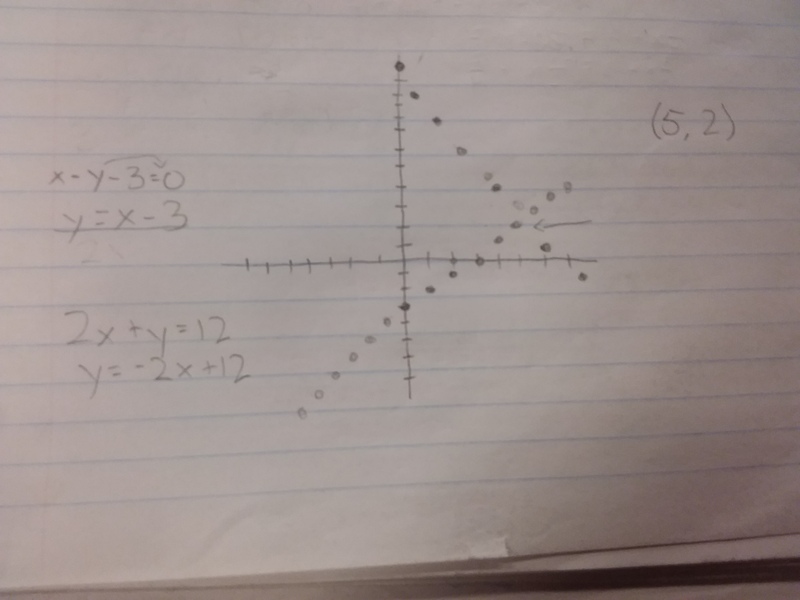 after you get your two perfect points you start on the left with the rise (y axes) and go up or down depending on if its a posative or negative slope, then you find how many points it goes down or up to get to the next point and you find how many points it goes left or right to get to your next point. 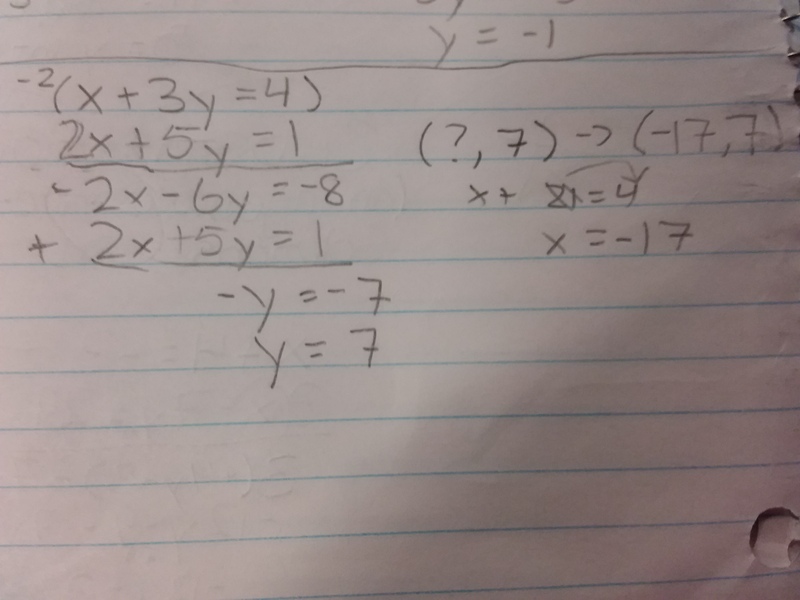 then you write a fraction of the two numbers (rise over run) and divide them too get your slope. this week in math 10 we learned how to factor perfect trinomials. 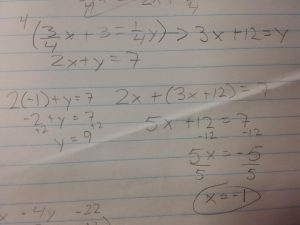 the first step to factoring it is to square root the first and last terms of the trinomial (when identifying and factoring the perfect square trinomial make sure to use CDPEU). the next step is checking your answer to do this you make sure the two binomilas are identical then you multiply the first term in the first binomial and the last term in the second, then you multiply the last term in the first binomial and the first term in the second binomial if the two terms you got from that add to the second term in the starting trinomial then you know you factored it right. 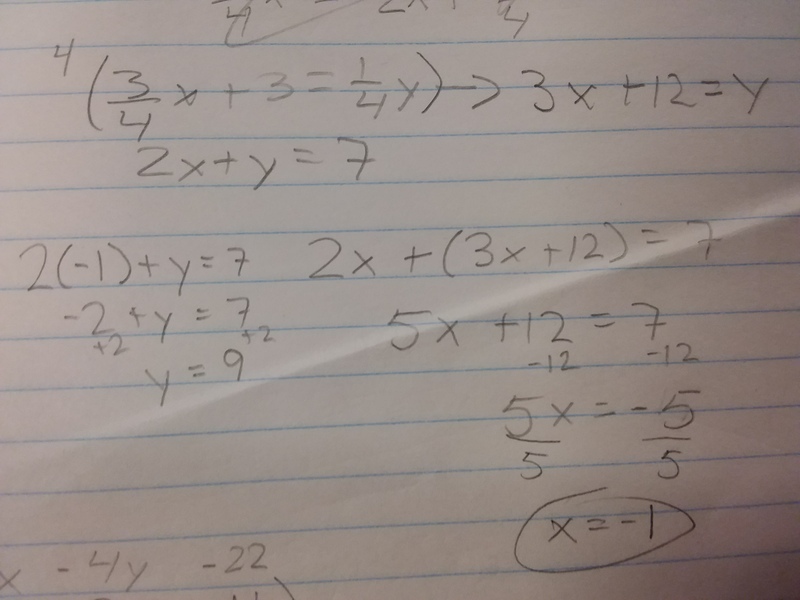 This week in math 10 we learned how to factor ugly polynomials. And a quick way to do it. a phrase that will help you make sure you are doing all the steps correctly and in order is CDPEU a way to remember these letters in order is: can divers pee easily underwater. The C in the phrase stands for common which means you need to figure out if the numbers have anything of common. The D stands for difference of squares, the way you know if it is a difference of squares question is if is it a binomial is there a subtract symbol and are they all perfect squares. The P is pattern for this you look to see if there is a pattern to solve the question easier. The E is easy so just look to see if it is an easy question. 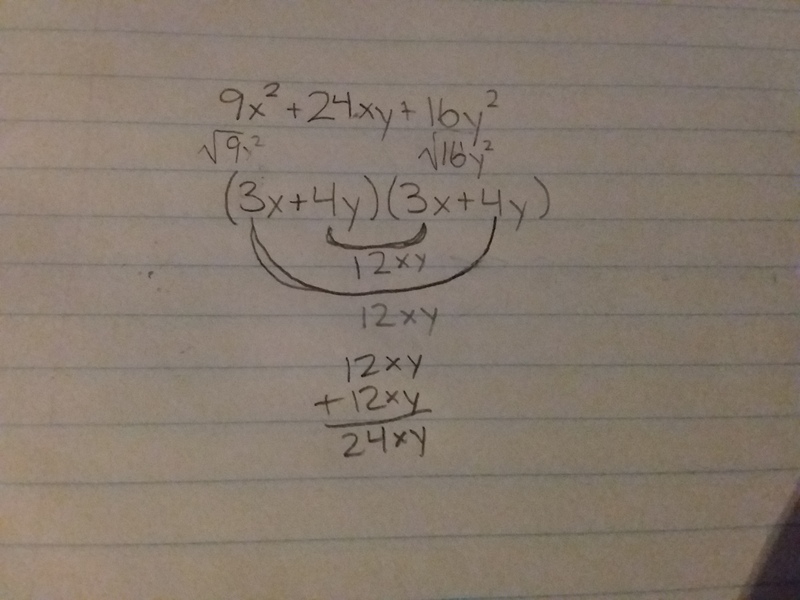 Then lastly U which stands for ugly this is when there is a non square number in front of the polynomial if it is this one you can’t use the rest of the rules. For factoring an ugly polynomial the first step is to try and find if it has anything in common with all the terms and divide. 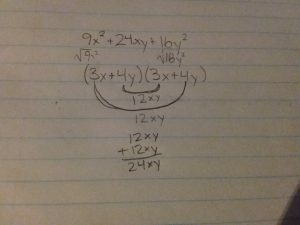 Then you rewrite the question but in the simplified form and you want to put that number you divided the terms by in front of the bracket. 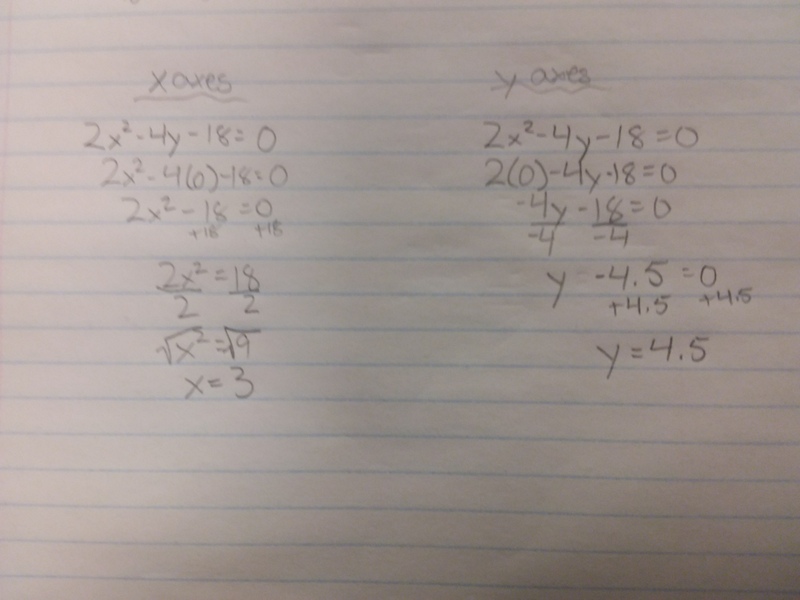 Then you make a square divided into four parts, the first term in your polynomial is going to go in the top left box and the last term is going to go in the bottom right box, then you multiply those coefficient together after finding the answer you want to find the factors of that number and pick the factors that add to the middle term if the answer you got from multiplying the coefficients is a negative you just make the bigger factor of the two a nagative and add them. 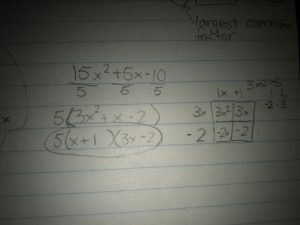 Then you put those factors into the remaining boxes and you have to add an x to the end of both the numbers. Then you go across the rows and down the collombs finding the common factor in the numbers writing the answer alonf the vertical and horzontal part on the outer sides of the square then you put those numbers into the brackets putting the verticals factors into a bracket and the horizontal factors into a bracket and you put the number you divided the first terms with at the front of the first bracket and then you have your factored ugly polynomial. 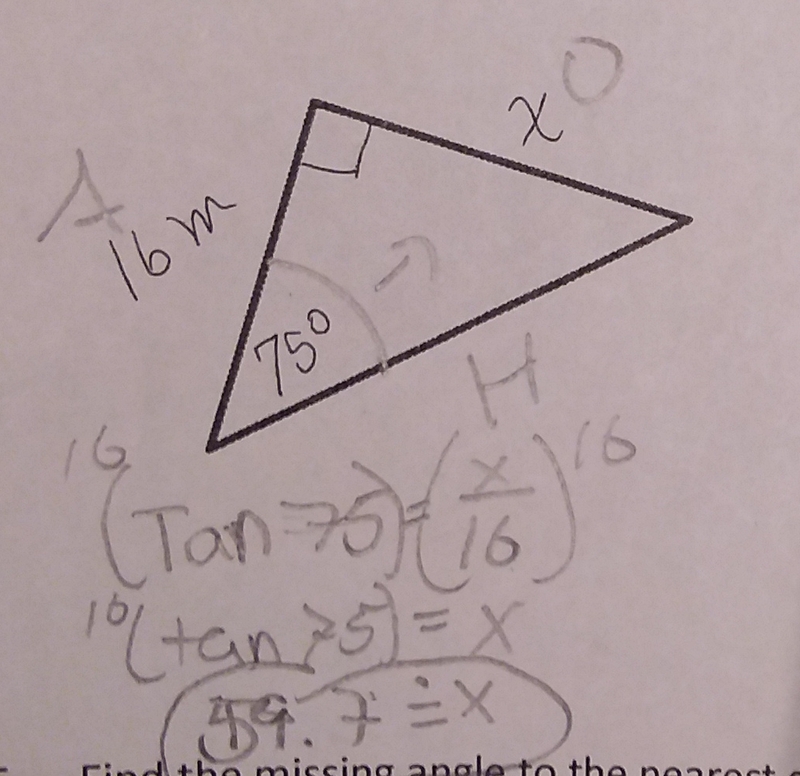 this week in math 10 i learned how to find a missing angle in a right triangle. to find the angle the first thing you do is determine whether you use sine, cosine or tangent you do this using the abbreviations SOH CAH TOA the first letter in the abbreviation is which main function you will use (sine, cosine, tangent). 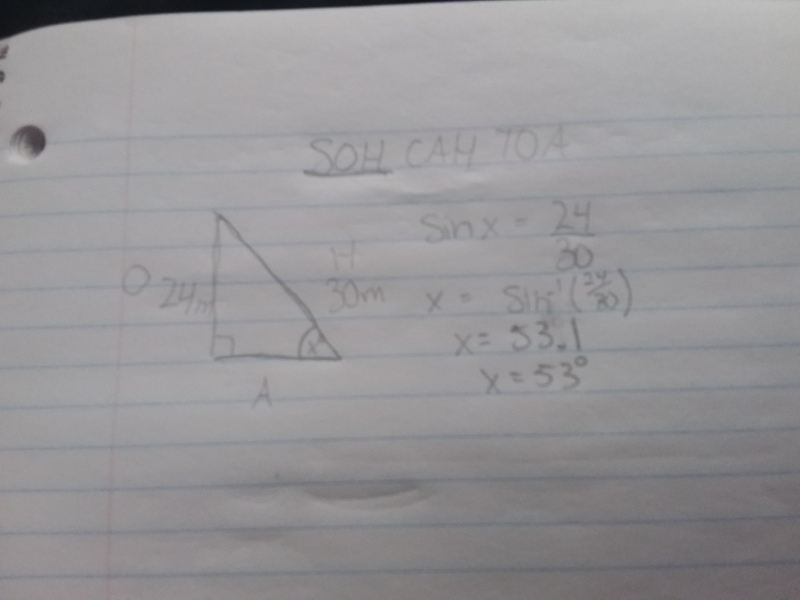 the second and third letters are for opposite, hypotenuse and adjacent and which one goes over which for example you have an opposite of 24m long and a hypotenuse of 30m long you would use sine because you only have the opposite(O) and the hypotenuse(H) and 24 would go over 30. after that you move the sin to the other side of the equation but you use inverse sin (sin-1) so its x=sin-1 (24/30) then you use your calculator to determine the answer. 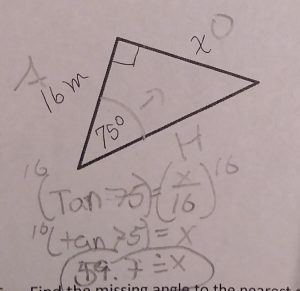 this week in math 10 i learned how to find the missing side length of a right triangle. to do this the first step is to label the hyponenuse, adjacent and the opposite the hypotenuse is the side accross from the right angle, the opposite is the side accross from the angle given and the adjacent is the last side. for step two you find which sides you use for the equation, the two sides you use are the labeled slides. step three you put it into an equation using sin, cos and tan depending on the sides given. 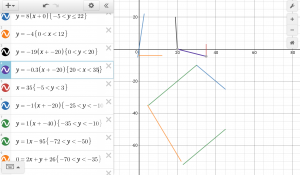 for example, tan then the angle = x/the side length given. for step four you multiply both sides of the = by the bottom #. then you are left with somthing like 16(tan34)=x then you type the first part of the equation into your calculator.